Apple Pay may be dominating the mobile wallet headlines, but now Windows Phone users can start making wireless payments at NFC retail terminals. Check out the Windows Phone store and you’ll find the Softcard app, which enables tap-to-pay at the same 200,000 places that new iPhone owners are using for payments, provided merchants have enabled Softcard for payments. Obviously, you’ll need a Windows Phone handset with an NFC chip and enhanced SIM card inside, and the software also requires [company]Microsoft[/company] Windows Phone 8.1 to be installed on your phone. If you have both of those, you’re all set to use the Softcard app. The app works more like [company]Google[/company] Wallet than [company]Apple[/company] Pay: Without a fingerprint reader available, Software uses a PIN to unlock your digital wallet. 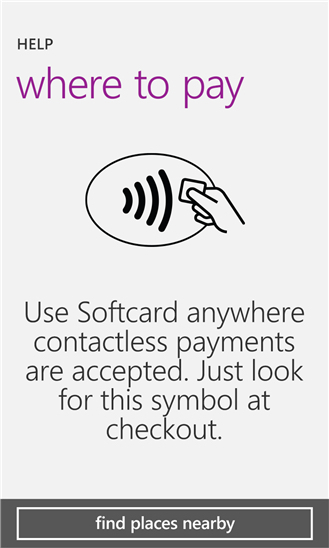 Once unlocked, you simply tap your Windows Phone to the NFC payment terminal to complete a transaction. Windows Central notes that unlike Apple Pay — at least for now — the Softcard app also works with merchant loyalty reward cards and other in-store offers; in that regard, it’s similar to Google Wallet. Softcard used to be called Isis and is a collaboration between AT&T, T-Mobile and Verizon in the U.S. While it may not have the sudden widespread appeal of Apple Pay, it offers the same mobile payment features and lets Windows Phone owners get in on simplicity and convenience of wireless payments. Can the Softcard Android app work on a Blackberry Z10? It has NFC and runs Many Android apps. Good question! I don’t have a BB to test with; it will depend on if the Android runtime implementation on BB has hardware access to that NFC chip. Enhanced SIM and PIN are really non-starters. Apple has set the bar for usability, I doubt anything less is acceptable to most users. Also you should note that each carrier needs to come out with their own app. Currently only AT&T has come out with theirs. Softcard has released a statement that the apps from other carriers are coming in the next few weeks. AT&T only? Does Verizon NOT use that d special SIM? It’s worth noting that Softcard also has an Android app. True, it launched first on Android but I didn’t think that would matter to Windows Phone users. Thanks!